April 6, 2010 -- Arkansas State University’s Electrical Engineering Program recently received a donation of an electric power grid protection system from Schweitzer Engineering Laboratories, Inc. (SEL) of Pullman, Wash., a leading provider of fault monitoring and protection systems for the commercial electric power industry. 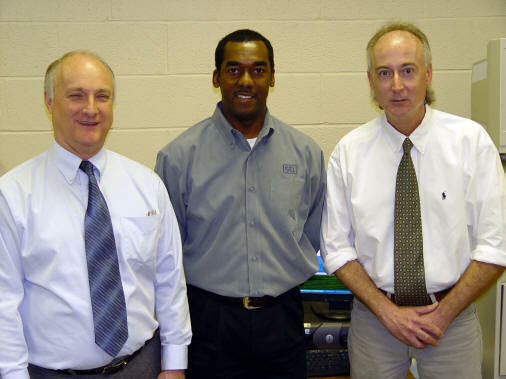 (From left) Dr. Robert Engelken, Director and Professor of Electrical Engineering; Emery Perry, Schweitzer Engineering Laboratories, Inc.; Dr. Paul Mixon, Associate Professor of Electrical Engineering. The donation, facilitated by Mr. Emery L. Perry, regional SEL field representative from Conway, consisted of a protection relay module, associated test and simulation system, peripherals, and software. The equipment will be integrated with electrical power and machinery coursework and research at ASU to demonstrate to engineering students how fault tolerance can be maintained on the electric power grid. Such faults are anything that causes disruption or failure in the distribution of electric power and can include obvious things such as lightning strikes, fallen tree limbs, and collapsing lines and poles, and less obvious phenomena such as harmonics and voltage and current wave reflections on the lines.